Handlebar shape enhances bobber styling. Sturdy and responsive 41 mm fork features large-diameter matte-finished shrouds and large billet-aluminum triple clamp for a distinctive look, and delivers confident, neutral handling. Dual-shock rear suspension features five-position spring preload adjustability for a smooth ride. Single front disc brake with twin-piston caliper grips a 296 mm drilled rotor between sintered metal pads. Rear brake is drum type. Spoke black wheels and hubs feature a 120/90-17 front tire and 160/80-15 rear tire to complete the overall custom look. Low 25.8 in. seat height. Tank-mounted speedometer in a stylish 3.7 gal. fuel tank. 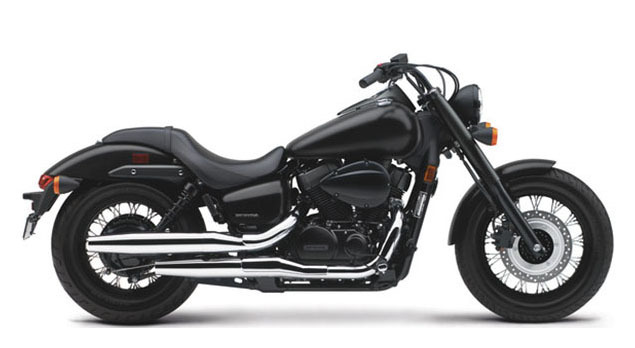 745 cc liquid-cooled V-twin engine produces impressive power over a broad rpm range.